A team of lawyers are set to take on a demanding 10k country run to raise money for a Worcestershire cancer charity. Eleven solicitors from Worcestershire law firm mfg Solicitors will tackle the ‘Wolf Run’ in Warwickshire on Sunday 14 April – aiming to raise £500 for the Worcestershire Breast Unit Haven which provides clinical and emotional support to people with breast cancer. Known as one of the hardest obstacle races in the country, the Wolf Run event will see the team taking on woodland tracks, lakes, thick mud and open ground in a 10k race against hundreds of other competitors. 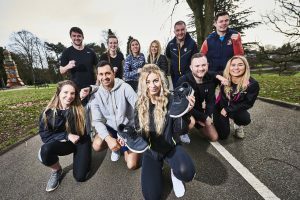 Jessica McSorley, a trainee lawyer at mfg Solicitors, said: “The Wolf Run is known across the UK for testing people’s mental and physical strength. “We know what we’re going to be up against as a team, but we felt it was a brilliant way to raise money for a charity which does a huge amount to help and support those with breast cancer. Lawyers from various departments are taking part, including partners and litigation specialists, Tom Esler and Sam Pedley.